Stumbling upon treasure and bones in the sewers. My first post on Eye of the Beholder produced some expected discussion on whether it is better or worse than its father, Dungeon Master. 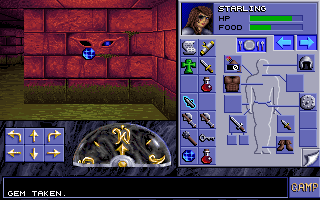 No one would seriously argue that it's a more original game than Dungeon Master, but Eye of the Beholder certainly benefits from being slightly later in the chronology, at least in terms of the DOS version. If nothing else, there's more variance in the wall textures, more ambient sounds, and the monster graphics are a bit better. 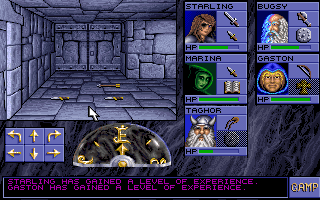 At the same time, it's too bad that Eye of the Beholder didn't compensate for more of Dungeon Master's weaknesses. My biggest complaint about the earlier game was the inability to evaluate weapons, armor, and magic items without some kind of cheat sheet from a spoiler site. This is true of Beholder, too, where there's no way to figure out the specific damage done by weapons, the specific level of protection offered by armor, or--more important--the nature of a number of possible magic items. Some previous experience with Dungeons & Dragons helps, of course, but I still don't know the functions of several things in my inventory. Beholder also carries forward the tradition of not identifying monster names on-screen, but at least you can find them in the accompanying manual. Level 3 brought a bunch of humanoid creatures that I thought were werewolves before I looked them up in the manual and discovered they were "flinds," which I guess are like super-gnolls. Fish-men on the same level turned out to be kuo-toa, and on Level 4 I encountered giant spiders (I think those were the only enemies on Level 4, actually), which of course I could have figured out for myself. It was important to defeat them from afar because they can poison characters and there are a limited number of potions of "Cure Poison" on the level. So far, combat has not been a strong part of the game, or at least my approach to it hasn't been very strong. I generally fight by backpedaling madly down the corridors while tossing missile weapons at the enemies. Rarely have I let them get close enough to engage my first two characters in melee combat, and rarely have I used any of my mage's spells. I don't know why I'm fighting like such a sissy, but it almost always works. 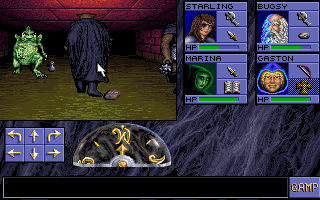 On the rare occasions that I get into a tight space, I can always do the side-step-turn, which works as well here as in Dungeon Master. Like Level 2, Levels 3 and 4 were both 30 x 30, but without using all of the available squares. (Level 4 had a weird wrap-around thing going on with one section that for a while confused me into thinking it was much bigger.) In fact, this game's design precludes using all the squares because it doesn't allow any corridors or rooms to share the same wall--there's always a gap. This was true of Dungeon Master too. I screwed up my map of Level 3 somewhere in the upper-right corner, and as soon as corridors started touching, I should have realized I needed to start over. My map of Level 3, with some mistakes in the top right that I didn't correct. The puzzles are getting a little harder, though not horribly so. My general approach has been to map as much of the levels as possible without touching anything first--no buttons, no switches, no pressure plates, no keyholes--then carefully return to each one and note its effects. 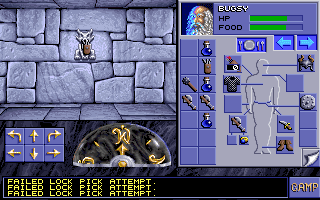 Usually, it's as simple as a switch operating a locked door next to it, but some of the buttons have effects on very remote parts of the dungeon. Level 3 had a puzzle involving the placement of four gems in four eye holes. This opened a secret area leading to Level 4. Level 3 had some tricky teleportation traps that whisked me to opposite ends of corridors that still looked the same as if I'd been continuing on, messing up my maps in the short term. There was one room with a bunch of pits and pressure plates that I had to navigate for some treasure, and a room labeled the "Museum," full of inanimate flinds and koa-toa who came to life the moment I picked up any of the scattered treasure. Level 3 and its deceptive "museum." Level 4 completely changed the map texture, transitioning from something that looked like "sewers" to something that looked more like a planned dungeon. Switches on the wall were replaced with cute little grotesques whose arms could be manipulated up and down. The entire place was crawling with giant spiders, and I had to carve through dozens of webs to make progress through the level. I reached the level right about the same time that commenters started warning me about the horrors of Level 4. Given that, I was expecting much more difficulty than I actually encountered. Just as I arrived on the level, I met a wounded dwarf fighter named Taghor. He related that his king had been wounded, and his prince kidnapped, in a battle against some Drow. He wanted to join me to search for his prince and said that his people should be on the level below. It was a welcome addition to the game--simultaneously an NPC, a side quest, and a hint at perhaps more complex encounters to come. Since I didn't need any melee fighters up front, I stuck a sling in his hands and kept him in the rear. Not much of a roleplaying choice, but more than you typically get in a DM-style game. It was nice to have someone to bear equipment, because I was nearly running out of space. So far, I've been loathe to throw anything away, so I've been lugging around extra axes, maces, daggers, suits of leather armor, shields, and other items. Part of the reason is that after encountering a puzzle on Level 2 in which I had to sacrifice a bunch of daggers, I'm paranoid that some random slot is suddenly going to want, say, a mace. Also, since I know there are NPCs in the game, I thought maybe there might be somewhere to sell some of this stuff, or otherwise get some use out of it. There's really no consequence to carrying it around. The game has no encumbrance system and items don't have weight. You can fill up each character's 14 slots whatever you feel like carrying. Only when I run completely out of room will it make sense to discard things. Starling's inventory is filling up. She's just put on a ring of uncertain use. 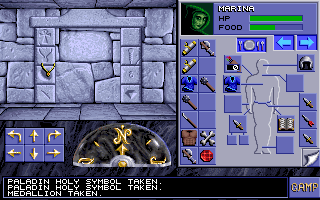 I also have a bunch of mystery items that I found no use early levels, including a stone dagger and stone scepter (you can't use them as weapons), an extra silver key of the type needed to open doors on Level 3, and an extra green gem of the type needed to open some areas on Level 3. I've found two rings. One I can tell by the effects on armor class is a Ring of Protection; the other I can't determine the nature of. A medallion that I put on my mage is also mysterious. For Levels 1-3, I'm pretty confident that all of the puzzles and encounters were self-contained, solvable entirely with items found on the same levels. Level 4 is the first level in which I'm leaving some squares annotated in yellow on my map (my symbol for places I have to return to). The first is a sign saying "Oracle of Knowledge" next to a slot in the wall. I was really hoping that putting unknown items in the slot would identify them, but it doesn't seem to do anything. I don't know what the slot wants. The second is a stone doorway surrounded by symbols, including an ankh, a medallion, a ring, and a gem. I was sure this would somehow involve the stone weapons I've been carrying, but nothing I tried to put in the associated slots seems to work. I'm also carrying some bones I found on the level, thanks to a hint from a commenter. I left one or two other sets on levels above me. I suspect that I need to solve these later, but if I'm wrong and they should have been solvable with items found on this level, I wouldn't mind a mild hint to that effect. It took me a while to figure out how missile weapons work in the game. For thrown weapons like daggers and darts, you need to line them up in your belt pouch. After you throw one, it will automatically replace it with the next one. A neat trick for front-row fighters is to keep a missile weapon in the left hand and a shield in the first slot on the pouch. After you throw your weapon, you automatically equip the shield. For bows, you want to stock arrows in the quiver next to the character's head. Unlike Dungeon Master, you can have over a dozen arrows ready to shoot at one time, making rear characters useful throughout combat. My cleric/ranger's inventory. Note the 13 arrows in his quiver. The ranger/cleric turned out to be a weird combination because in order to cast a spell, you have to activate the cleric's little symbol, but it's not available if the character is holding a two-handed weapon. Fortunately, I haven't needed him in combat much so far. The game does a really good job with ambient sound, including miscellaneous thuds and drips as you explore. More important, each creature makes a unique sound, which gets louder as it nears. This is legitimately freaky when you're fighting something like giant spiders, capable of poisoning you, and you hear them getting closer but can't see them yet. Commenters have suggested that enemies respawn, but only in certain areas after a long passage of time. I haven't encountered any respawning yet that I know of, but on Level 4, I never got to the point where I stopped hearing spiders somewhere in the distance, even when I couldn't find any. Characters get experience for doing a lot of mundane things, including opening doors and wandering into important rooms. There's no fanfare associated with leveling up; you just get a message that it's happened. At least half the time, I don't even see the message. This serves as a reminder that, in general, leveling in second-edition AD&D isn't as fun as other games, where you get to make choices about skill and attribute increases. Two characters level up from, as best as I can tell, walking into a room. Picking up all the thrown/shot missile items after each combat is getting a little old. It's possible to run into your own missile weapons. They fire slow enough that if you shoot and immediately walk forward, your own arrow hits you in the back of the head. Combat is a little more difficult here than in Dungeon Master because the attack buttons aren't all conveniently lined up in a row. You have to dart around the screen to right-click on the weapons and make the attacks. I found a "Fireball" scroll at one point, and my mage scribed it to her book. I'm looking forward to seeing how it works in a first-person game. She hasn't leveled up enough to get it yet. Lots of potions in my inventory. Fortunately--unlike every other item--the game identifies these automatically. I've got a Potion of Giant Strength, a Potion of Speed, 4 Potions of Cure Poison, 2 Potions of Healing, 2 Potions of Extra Healing. Inevitably, I'll save them for that one combat that really needs them and end up never using them. So far, I've only encountered a single lock that my fighter/thief was capable of picking instead of having to hunt around for a key. Hey, maybe that's why I've got an extra silver key! This just about never works. I like mapping, but it's also a little annoying, especially where (unlike a lot of games from the early 1980s) Beholder actually uses the mouse, so I have to get DOSBox to "release" it when I want to move over to the map. I'm going to head down to the CVS later and buy some graph paper; I think it would actually be easier to map by hand. While I was in the midst of the entry, commenters told me about a "secret quest" to uncover on every level. I only uncovered it on Level 2, so I'm going to have to re-explore Levels 1, 3, and 4 if I want to figure out what I was supposed to do there. I'm having fun with Eye of the Beholder, but already I'm starting to remember the things I don't like about DM-style games, starting with how fundamentally deterministic they are. Every player finds the same encounters, the same monsters, the same items in the same places. 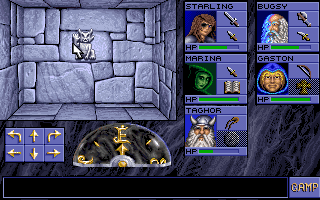 However, the discovery of Taghor gives me hope that the game has more of a plot to uncover than the typical DM clone. I guess we'll see in the upcoming levels! I think its interesting that we see things so differently from a Roleplaying / Game Mechanic Perspective. While you were like "Why on earth would I carry Bones with me???" it was totally normal (gamey) for me to pick up everything thats not nailed down. There was a time I would have picked up the bones, I suppose, but keep in mind that I just came from The Savage Empire, where trying to pick up every item would have been absurd. Try the "gather everything" approach in Oblivion or Skyrim and see how far you get. There are some games where you pick up everything that can be picked up and some where that's an exercise in futility. Until you have a few hours into the game, it's hard to know what kind of game you have in front of you. 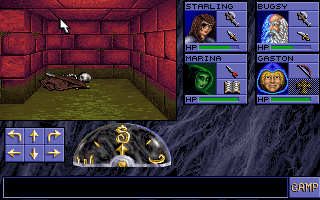 I held onto a lot of consumable items until Eye of the Beholder II, where I ended up blowing through many of them in that game's own infamous level. Ha! Amazing how perspectives can shift in time. In this game you definitely grab anything that isn't nailed down. In Savage Empire you didn't, because of Origin's filigree work ("We Create Worlds"). The average computer game player of the time didn't play both. There simply wasn't that much of an overlap. These days, sure, people who crossed over are by default the ones left talking about it. But back then not so much. These days it seems good to criticize a company for including useless items in the game ("if they're useless, then why even put them in!?!?!") as opposed to the original viewpoint of "our worlds are so vast we can have the luxury of including utterly useless items. They'll be useful to the people in the story but not you the adventurer," they said. This greatly added to the verisimilitude of the game, a novel idea not often appreciated after the fact. That you could perform these actions that were utterly useless to you the PC, but that would be appreciated by denizens of the world you temporarily inhabited, is lost on today's gamers. It is a frontier long since crossed and to a modern eye looks a lot like a chintzy Pioneer tourist trap in Pennsylvania. Jeff Vogel of Spiderweb is a big fan of the 'realistic useless items' trope. His levels in every game are full of dishes, spoons, goblets, shovels and general trash. Man... don't make me remember sad stuff. 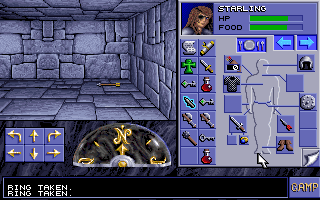 When I first started playing "Avernum" I was catching everything that I saw, fearing that items like sticks, stones or spoons would prove useful in the future. A lot of people derive enjoyment from having random items laying around. Adds to the immersive qualities etc. I don't really experience that feeling. I'm down with every single item being related to combat, cash or quests. I think the one exception to this in the Infinity engine series were the books (which might have only been in BG I?). Just let me open chests, loot corpses and click 'take all'. I don't mind gathering/crafting in principle but in a lot of games it gets too fiddly to track all the recipes and ingredients just to receive an incremental upgrade here and there. I'd be interested in Chet's take on Terraria, which is a game I quite like. You can cast "detect magic" to see if any of your items, like that unidentified ring, are magic, but it doesn't say what they do. With armor, just like Wizardry, go to the character stats page and it tells you what your AC is so you don't need to identify armor. A lot of the magic weapons have nicknames like "Ashbringer" or "Sting" or whatever and I'm not sure if there's a way to identify them but if you transfer your guys to EoB2 then it auto-identifies them as +1 +2 +3 or whatever of the standard weapons. "Detect Magic" tells me that two of the rings I've found plus the medallion are not, in fact, magic. So what are they? Just useless bits of equipment? Is it possible to create an item stash on a convenient floor? That way you can just go back for the "junk" if necessary? Gur zrqnyyvbaf naq bar evat ner npghnyyl abg jbexvat nsnvx, gurl jrer fhccbfrq gb gjrnx erfvfgnapr fgngf, gung ner abg genafcnerag va tnzr, naq cbffvoyl oebxra, be npghnyyl vagraqrq gb or qrpbengvir. Gur jbexvat barf ner gur evatf bs cebgrpgvba naq gur evatf bs serr snyyvat. V qba'g erzrzore vs gur evat bs fhfgranapr (sbbq one qba'g qrpernfr) jbexf va RbO 1 gbb. I'm not sure if the game will make your items disappear if you do that. I think non-magic rings and medallions do nothing, unless they lower your AC, so check to make sure. I'm all for figuring things out when possible--it's a key element of NetHack, for instance--but the game has to give you some more clues. There are certain effects that are nearly impossible to assess by simple observation (e.g., slow digestion, +1 or +2 to THAC0, +1 or +2 to damage). If a ring conveys fire resistance and there's only 1 level of fire-using creatures, I'm not going to have a handle on what it does until I've already survived most of the level. I don't consider this "part of the charm." None of the non-magic wearable items have any effect on the character (except for the armor that's worn on the chest slot, of course). Like with the damage values for normal weapons, this is clarified in the manual for the second game. Maybe players or reviews complained about it. The game does give you clues - in a way. I am not sure whether it was a conscious design choice or just a feature not yet invented but indeed it does not explicitly display item stats via UI. You can safely discard non-magical, non-quest, non-missile items (not that there are that many of those or that you run out of carrying capacty either). Once you know the item is magical you will find a way to identify in-game. Shields, helms, magic rings, (magic?) bracers, do lower your AC. Yes, that part you can tell, but shields and armor in D&D aren't just "shields +2" sometimes. They're "shields +2 vs. dragon breath" such. The AC effects are only a small part of the identification. You'll figure out the deal with the stone doorway in good time. Do you make use of the 'up in the air' inventory slot at all? Oh, shoot. I forgot to include that. Thanks. I just added it. I've only had to reload once "for real." I've reloaded several times because I was trying to take the perfect screenshot and let a creature attack me, but I don't count "administrative" reloads like that. Shortly after I posted, I got to the next level and figured out how the stone doorways work. Now I'm obsessed that I've missed one of the objects. I don't know what you mean about using the "up in the air" inventory. I know you can throw things from this slot, but that doesn't seem to do anything that launching a missile weapon doesn't. Does he mean left click to pick up, right click to punch, left click to put back? I don't recall having to do it. It only works if you do gosu dance as well, and if you do gosu dance it alone is enough to get you past the combat sequences. Chet: Launching a missile weapon from the air slot has no cooldown, unlike hand slots. Walen's is the other example. You think that was intentional? It feels a bit like cheating. I wonder, if you fire a missile from the "up in the air" slot, whose statistics does it use to calculate the likelihood of hitting? I could be wrong, but I don't think all missile weapons strike the target just because the target is there. I think there's a THAC0 element. The missile has to come from somewhere. Just check whose ammo is missing and you'll know who shot it. You misunderstand. The "up in the air" slot isn't from anyone's inventory. It could be something that you've just picked up from the ground, before you assign it to a specific character. At that point, it's not clear whose "hand" is grabbing (and throwing) the item. Ah... if it's from the ground, it's just a one-shot thing anyway. Cheap? Probably, but it's not like this is a game about gentlemanly fisticuffs. When I first discovered the combat waltz, I thought it was cheap and didn't use it. Problem is, the game becomes pretty reloady. That's the prob with EotB combat, it's generally either trivial or really rough, depending on whether you exploit the engine or not (same goes for Pillars of Eternity, sadly). My guess is the up-in-the-air thrower is whomever is in slot one, although I guess it could just have a predetermined THAC0. I feel that DM-style games implicity ask the player to exploit them. They feel built in keeping with that. Captive in particular springs to mind. 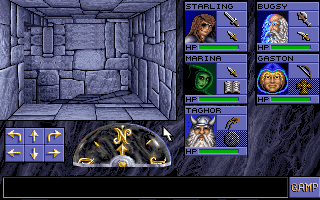 In Dungeon Master the "up in the air" slot used and affected the stats of the selected "primary" character. It may be the same here. That does seem the most likely explanation. Tristan, I'm using "combat waltz" from now on. That describes it perfectly. Well, at first the "combat waltz", or gosu dance as I call it, does seem a bit exploity. But belive me, there ARE enemies in-game that are neigh on impossible to beat by just standing still. Which makes me think that it is not a bug, it is a feature you are supposed to take advantage of. Plus, with this one trick combat difficulty curve in EoB is pretty steady, if slightly on the easy side (still far from trivial). About Pillars of Eternity - what exploit do you have in mind? I have yet to play it first-hand but from what I can see there is a proper approach to combat required to win but nothing immersion-breaking. rot13 for those who want to play PoE without knowing the exploit. Zbfg pbzongf va CbR orpbzr gevivny jura lbh ernyvfr gung gurer vf n znkvzhz qvfgnapr gung na rarzl pna jnaqre orsber ergheavat gb jurapr vg pnzr. Fb lbh fubbg na rarzl, eha njnl, naq gura jura gurl ghea nebhaq gb tb ubzr, fubbg gurz ntnva. Evafr naq ercrng hagvy lbh xvyy gurz jvgubhg rire univat orra va zryrr enatr. 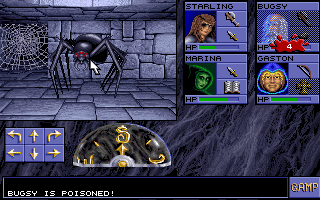 The spider level's probably inspired by the purple worm level in Dungeon Master. 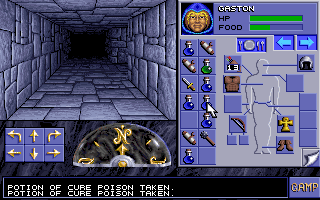 Poison in that game eventually wore off, though, while it stays until treated in Eye of the Beholder. At least it doesn't drop characters instantly like in the Gold Box titles. I had a pretty tough time of it my first run through the game. There always seemed to be a lot of spiders blocking my way back from the looping corridor. But there's nothing over there that's absolutely essential, so a player could just go down to the next level, and maybe come back after his party's tougher. I'm fairly certain that in 2nd edition AD&D once you fail to pick a lock you can't successfully retry - so if your multiple attempts didn't involve reloads you'll never pick anything with a reclick. Also low level thieves have an abysmal chance of success so it's pretty unlikely to work in the first place. So I think you can pick locks but it generally takes save scumming. Also, bones aren't useless but they also aren't at all needed. Hopefully that was vague enough to not be a spoiler. This video game makes a fresh calculation each lockpicking attempt, so it's possible you'll open a lock after multiple clicks. But there's also a chance with each click of critically failing and losing the lockpick. For some locks, I don't know if the chance of success is zero, or just so low that you'd need a high-level thief and a lot of patience. I have this memory that the sound from unpickable locks was different...Maybe I'm confusing my games. I would hardly call it an "inarguable improvement" when the SNES version of EOB looks hideous compared to PC release. Not to mention that playing a game like this without a mouse is torture, and while a mouse peripheral existed for SNES and EOB supported it, almost nobody owned one. I've played through both- how does the SNES EotB look worse aside from having a lower resolution? They look enough alike that I have to look for specific differences (things like the width of the message box at the bottom of the screen) to tell them apart. Also, I tried playing EotB with the SNES mouse, and having *only* the mouse was a lot worse than having *only* the controller. Pressing Y switches you between moving your party and the cursor quickly enough that within a few minutes it becomes second nature, and I found myself missing having a game controller when playing in DOS. The combat between EoB and DM is as different as it can be in two games with basically the same interface. It's not only the spell pause in EoB and you have more room to dance in DM, the experience system also changes the dynamics. In DM, you have incentive to train in your classes, for example get fighter levels to use the better options of weapons. In EoB, you simply aim to kill everything and get experience either way. Both systems have their advantage, DM sometimes feels like you are training even against strong enemies, while EoB encourages to use all your might and everything you have. I don't think there are many games which are so much compared to each other as DM and EoB are. 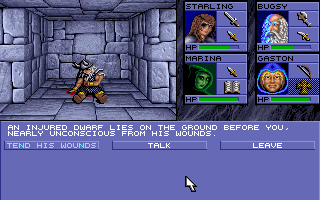 Oh yes, the different leveling-up process also affected your approach to combat (and combat itself in the long run). The same can be said about the different magic systems, where again I feel that DM's rune approach was more interesting, unique, and ultimately fun - though it wasn't actually EoB to blame, but the fact that the AD&D rules for resting and memorization of spells (instead of a mana bar that replenishes over time) probably did not fit real-time gameplay so well. Anyhow, combined with the (inexplicable) spell pause, this resulted in severe underutilization of spells in favor of melee and ranged attacks. The reason those severs turn in to something more habitable looking might be the undermountain http://forgottenrealms.wikia.com/wiki/Undermountain so the game is essentially following the lore here. From the map you can see that "dungeons" are right below the "sewers", how deep the computer game takes you I have no idea but the module I've played on table top D&D was quite a handful. Then why isn't there any kobold children, baby spiders and flind toddlers around? I think the broader question is this: Are we to regard everything we experience in the 30 x 30 dungeon as the totality of the dungeon, or is it an abstraction for an even larger area in which many things are going on (baby spiders nesting, flinds hunting for food for their families) and many things (privies, ventilation systems, beds) that the game doesn't show us? Even in modern games with extremely detailed graphics, we're not intended to be seeing EVERYTHING, surely. Whiterun must have more than like 10 residents, after all. That's what I tell my tabletop RPG players as well. But do they listen? NoooOOOooo... Pedantic @$$wipes. So, I ended up shoving latrines, air shafts, nurseries, mess halls and what-nots in every freaking dungeon in my games. If I could do it, I expect million-dollar budget AAA companies to be able to do it too. I remember that FO3 and FO: NV do have outhouses. Other than their invincible children, it's pretty okay in its realistic portrayal of actual living conditions. The lack of such things could be a blessing of sorts - it stops players from doing things like slaughtering goblin children for experience points. This is one good argument for the experience system used in Pillars of Eternity. F3 and New Vegas and most MMOs manage to preserve a neat sense of scale (due to long draw distances) despite the fact that everything is in unrealistic vicinity to one another. I think there's a sweet spot where a location can feel suitably populated but not irritating from a gameplay perspective. It's part of why Athkatla is probably my favourite game location of all time. I think it nails it. And why Witcher 3 is my favorite game at this point of time. It definitely nails it. Yeah, but no goblin children. Then again, it's no Azure Dreams. Wasn't Azure Dreams that game that's like Rance but a roguelike version? Maybe I'm confusing it with another game. Azure Dreams is semi-roguelike: You enter the tower at level 1 every time but you also bring a companion pet who can be fairly high level from earlier runs. It's nothing like Rance (I assume you mean M rated etc). Azure Dreams is about a kid and his pet monsters. The dumbest part about D&D is how they handle the concept of evil. There's too much of the "I did it for the evulz" caricature and too few rationally self-interested types who simply assign zero value to the well-being of others. I could have sworn there were romance options or something in Azure Dreams, though? I admittedly never played it and could be thinking of Thousand Arms, though. I think HG101 has an article about it, but it's been a while since I read that one. "A neutral evil villain does whatever she can get away with. She is out for herself, pure and simple. She sheds no tears for those she kills, whether for profit, sport, or convenience. She has no love of order and holds no illusion that following laws, traditions, or codes would make her any better or more noble. On the other hand, she doesn't have the restless nature or love of conflict that a chaotic evil villain has. " "Neutral evil beings consider their alignment to be the best because they can advance themselves without regard for others." Thanks, anonymous, but right now I wouldn't have enough time to work on the book even if someone was offering to pay me. What I should do is offer to split the royalties, 50/50, with anyone who wants to edit my past material into a book. I've already contributed the text, you do all the formatting, editing, and layout. Think anyone would bite? Surely someone here with the requisite skills and experience would take you up on that, and if not here, HG101 could set you up. Possibly, Chet ... just possibly. Also, Azure Dreams did have some dating options, but it was kept very E-rated. How does one even know their own alignment to consider it in the first place? Then again, it'd be pretty sad if a kind and nature-loving guy was out tending to the injuries of a doe/cooking meals for the homeless/goody what-nots and meet a cleric who cast Detect Alignment on him and found out that it's Chaotic Evil. No, wait. It'd be really funny. Daniel - The problem is that every chaotic evil character is basically portrayed as an individual with antisocial personality disorder, when they could just be an independent anarchist completely out for themselves. In the latter case, a CE adventurer would still help people if the reward expectation was sufficient and would still work in a group for as long as that group wasn't too prescriptive and it served the CE's goals. Farmer: Good sir! My field is infested with flaming Balrogs who are eating all my sweet, sweet corn! Please help to eradicate them and I will bestow upon you the almighty Morally-Ambiguous Sword Of Godslaying! YOU (Good): Of course, kind sir! Forsooth, the Balrogs shall face such reckoning that they shall pray they will never hear of The Kingdoms of Amalur! You (Evil): Yeah, yeah, kill Balrogs, get super artifact. Why the f*** not. You probably hid it somewhere that I can't find so I couldn't just murder you to get it anyway. In the old days of D&D everyone knew their own alignment, and in one edition there was even an alignment language that only members of that alignment could understand. Asking someone what their alignment was was allegedly 'really rude'. There was one D&D adventure where an assassin sent after the party spoke all the Good alignment languages and would pick a language after observing the party to deceive them. Also, the first Witcher did a great job showing cities that felt like cities, instead of Thorps smaller than where my Dad grew up. I used that tool right up to the ending levels. "Rock Band 4's campaign is a straight up RPG"
I'm gonna call my rock band "Unholy Paladin & The Bladesworn Clerics". Metal as fu- uh... fundamentalists.